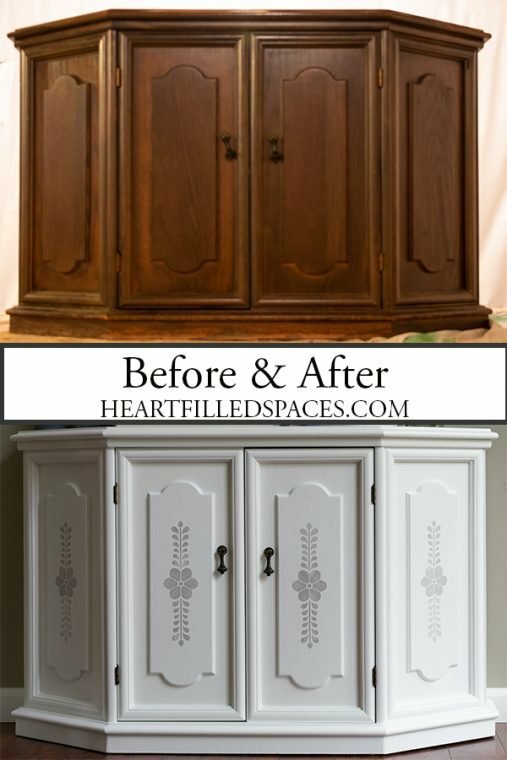 I am so excited at the way this storage cabinet makeover turned out! This cabinet was a great find at a resale store in my area for $17. It is real wood and there was very little damage to it. The dark color was dated and it had some water stains on the top. It definitely needed to be refreshed and brightened up. Here is the finished product. I sanded the entire surface of this piece and then thoroughly vacuumed and wiped it down. Then I primed it with Zinsser Bulls Eye 1-2-3. I am always trying new methods of painting. I guess I’m still looking for the magic formula. 🙂 This time around I decided to use my Wagner Control Spray Max , mostly because I thought it would go quicker and I needed to paint the inside of the cabinet. What I like about using a sprayer, is that I can still do the project in a corner of my unfinished basement. As opposed to using actual spray paint in the can which must be done outside (because of the smell) when the weather is co-operative. Thin the paint. You will need a stop watch and your paint viscosity cup (comes with sprayer). 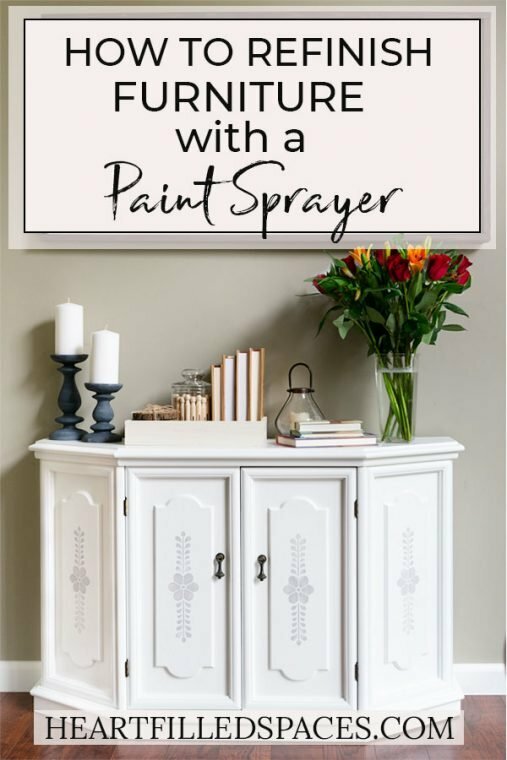 Add some paint to the container for the sprayer and add water to the paint. Mix well. Then dip the viscosity cup into the paint/water mixture and start a timer. When using latex paint, the viscosity cup should empty out by 50 seconds. If it empties too fast, your paint will run; empties too slow your paint will be bumpy. You should have a viscosity chart in the manual of your sprayer. All paint is a little different, so you will want to test it out on cardboard before you start your project. The paint color is Behr, Snowy Pine. Make very thin even passes with your sprayer. Don’t try to cover too much at a time or your paint will run. Wait until the paint is completely dry before re-coating. The stencil I used is from Michaels. It was made by ArtMinds. I made a light center mark to ensure that my stencils were perfectly aligned. Use masking tape to hold the stencil in place. 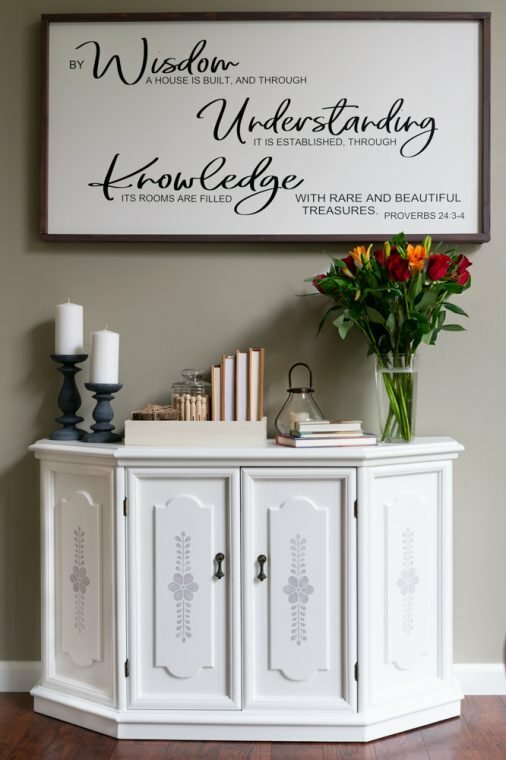 Using a stencil brush, dip just the tip of the bristles into the chalk paint. Then dab the paint off onto a paper towel, so the brush is not too loaded. Using a circular motion go over your stencil. 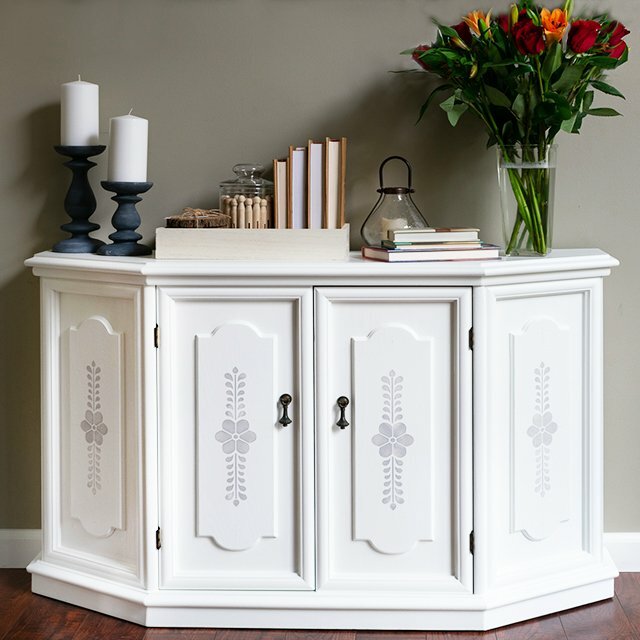 The chalk paint I used was Rustoleum Chalked in Aged Gray. I applied two coats of Minwax Polycrylic to protect the surface.